Yesterday's noticeable influx of monarchs has given us a nice monarch day today. Census totals for the day are 151.5 monarchs per hour, and we've been tagging dozens of monarchs in the local gardens. Whenever we're out there tagging, passersby seem to notice and ask questions. We're always happy to share information and show others how we conduct our research. 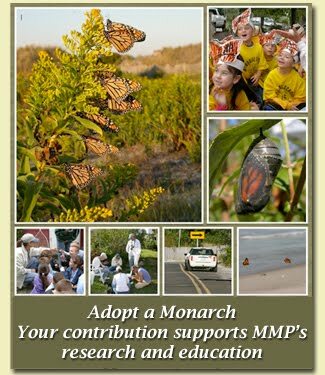 Our season ends next Wednesday, but if you see one of us out there with a butterfly net, don't hesitate to stop, observe our work, and learn about the wonders of monarch migration. junction of Lighthouse and Coral in Cape May Point. procedure described in her Oct. 24 blog post. Cape May Point this autumn.